Businesses understand more than ever that they depend on data for insight and competitive advantage. 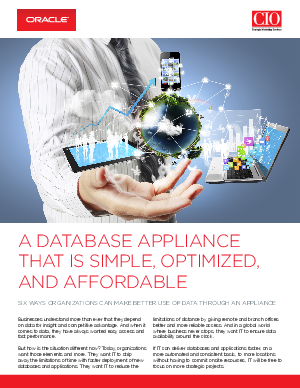 And when it comes to data, they have always wanted easy access and fast performance. But how is the situation different now? Today, organizations want those elements and more. They want IT to strip away the limitations of time with faster deployment of new databases and applications. They want IT to reduce the limitations of distance by giving remote and branch offices better and more reliable access. And in a global world where business never stops, they want IT to ensure data availability around the clock. If IT can deliver databases and applications faster, on a more automated and consistent basis, to more locations without having to commit onsite resources, IT will be free to focus on more strategic projects.